There are many ancient Nordic legends of Shor and his compatriots. Kyne was his wife and later his widow, Stuhn was one of his Shield-thanes, and Tsun died protecting him. They say he fought Alduin on the spirit plane at the beginning of time. They also accept "Lorkhan" as the elven name for Shor; the two are widely regarded as the same entity, as is Shezarr (though the reputation of the "Missing Sibling" of the Eight Divines was watered-down a bit to be less offensive to elven cultures and those they had influenced). Shor's also referred to as an "aspect" of Lorkhan. The Nords believe the chief of the gods had been killed by elven giants in ancient times, and they ripped out Shor's Heart and used it as a standard to strike fear into the Nords. This worked until Ysgramor "Shouted Some Sense" and the Nords fought back again. Knowing that they were going to lose eventually, the Elven giants hid the Heart of Shor so that the Nords might never have their god back. According to Imperial scholars, the Nords believe their old enemy from Atmora, Orkey, fooled them and used foul magic to reduce the Nordic lifespan to six years. Through unknown means, Shor showed up and removed the curse, throwing most of it onto the nearby Orcs. Nordic legend goes into greater detail. During the reign of High King Wulfharth in the First Era, Orkey summoned Alduin, and nearly every Nord was "eaten down" to six years old by the Time-Eater. The boy Wulfharth pleaded to Shor for help. Shor's ghost then once again fought Alduin on the spirit plane, and he won. Orkey's folk, the Orcs, were ruined. It was by watching this battle in the sky that Wulfharth learned a new use of the thu'um which allowed him to save his people. During the War of the First Council around 1E 700, the Nords learned from the Chimer Dagoth Ur that the rediscovered Heart of Shor was at the center of that dispute between the Dwemer and the Chimer. The Tongues sung Shor's ghost into the world again, and he gathered an army as he did of old. Then he sucked in the long-strewn ashes of King Wulfharth and remade him to serve as a general. But the Devil of Dagoth petitioned to be that general, too, emphasizing his service in bringing the Nords the information. So Shor kept them both as generals and marched on Resdayn. The Nordic legends differ on what occurred at the Battle of Red Mountain which followed. One story is that the whole thing was a ruse, and as soon as Shor's army arrived at Red Mountain, the Chimer and Dwemer joined together to attack them. Their sorcerers lifted the mountain and threw it onto Shor, trapping him underneath Red Mountain until the end of time. The other, "secret" version of the tale is that Shor's Heart really was at the mountain. At Shor's urging, his generals collected more troops of all kinds, even forging an alliance with Orcs. Many Nords could not bring themselves to ally with their traditional enemies, even in the face of Red Mountain, and were close to desertion, but an impassioned speech from Wulfharth about the importance of Shor and this war kept Shor's army together. Shor got his Heart back briefly during the battle, but he needed time, and his opponents set upon him wielding Kagrenac's Tools. In the ensuing melee, Shor was wounded by the Dwemer King Dumac, who was killed by Dagoth Ur, who was then struck down by Dumac's rage-filled friend, the Chimer Hortator Nerevar. Shor mortally wounded Nerevar, but Nerevar's trickery allowed him to cut out Shor's Heart, defeating the chief of the gods once again. Many important figures throughout history have been attributed with some relationship with Shor. Saint Alessia was called the wife of Shor. When Nords saw Pelinal Whitestrake during the Alessian Slave Rebellion, covered with elven blood after the first Pogrom, they said that Shor had returned, but Pelinal just spit at their feet for profaning Shor's name. 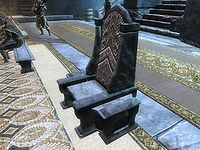 The unusual success of High King Gellir in conquering various Dwemeri city-states in Skyrim during the First Era was attributed to the blessings of Shor. The zealotry of King Wulfharth earned him the moniker "Shor's Tongue". In the dark days after the fall of Saarthal, Shor was demonized by the elven rulers in Bretony, where he became known as Sheor, the Bad Man. Someone called "Shor-El" is said to have claimed that Cyrodiil became an egg during the famous thousand-year Dragon Break of the First Era. A small mining community in Skyrim is called Shor's Stone.